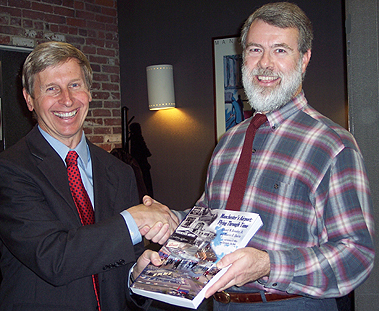 new Manchester Airport book from co-authors Ed Brouder (l) and Moe Quirin (r). "A regional airport does not appear to be an obvious subject for a full-length book, let alone this thoroughly researched tome that comes with chapter endnotes and - a rarity these days - a comprehensive index.... 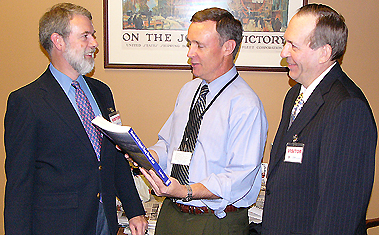 The authors spent more than five years preparing this book, which is a model for any airport history." "Santa came early this year, and I am extremely grateful to find a copy of Manchester's Airport: Flying Through Time in my pre-Christmas stocking. While I did immediately read Chapters 14 and 16, I will have to save the rest of MHT's interesting history for devouring at a later time. However, it's obvious that the two of you engaged in extensive research for this wonderful book." - Herbert D. Kelleher, Executive Chairman, Southwest Airlines Co. Flying Through Time from co-author Ed Brouder. 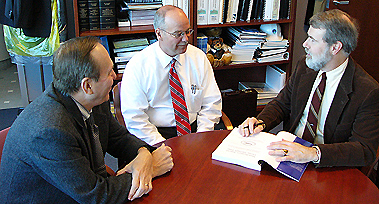 Director of Manchester-Boston Regional Airport. 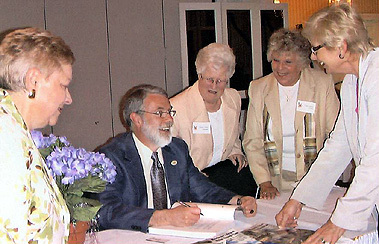 May 1, 2009 - Co-author Ed Brouder signs copies of the book after addressing the Manchester Women's Club. 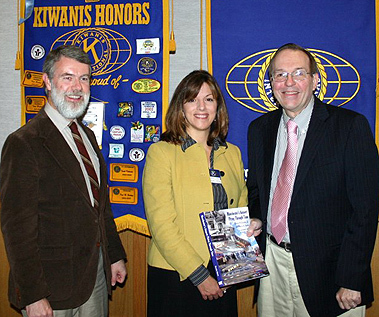 Ed and Moe with Hooksett Kiwanis president Jennifer White. "Manchester's Airport: Flying Through Time"�it is a title with a deeper meaning than is first apparent. You need to have the book to understand. This masterpiece reveals a myriad of intricate details about the history of the airport that changed the outcome, as we know it today. It gives you almost a first-person feeling of the sweat and prices paid by all who played a part in its existence. Very soon you'll be aware that you have at your fingertips THE ultimate resource of information, in a well-compiled, easy to reference format. There are no other "officials" on the subject than these authors. If these aren't accolades enough, from a personal perspective, the fine narrative as it unfolded, spurred memories of a childhood growing up in the shadows of the passing planes. Though my old neighborhood has changed as a result of the infrastructure development, I can live these memories again. And to sweeten the pot further, a previously unknown tale emerged of my own ancestors taking flight here in the early days, only to lose their homestead to the growth a few short years later. No praise is enough�buy the book!"